The DIY edition Jan 2018. The chain locker in the forward most part of Britannia’s bow was totally inadequate for the 250’ feet of 3/8” inch chain, which I considered a minimum for my 22 ton boat. Every time we weighed anchor—even when only part of the rode had been laid—the chain always piled up in the locker and jammed the windlass. Someone had to then scramble over the forward cabin bunks, open the locker’s equally inadequate little door, then push the pile of wet chain to one side, to allow the remainder to be wound in. Sometimes this had to be done twice and was very tiresome, especially when my wife and I were the only two aboard. The reason the chain would not self-stow was because the bow locker was in the steep vee shape of the bow and the chain had no room to spread as it piled up. There was nothing that could be done to enlarge this space, but every time it happened I swore I would somehow try to re-route the chain into one of the large compartments under the fo’c’sle bunks. These were easily big enough to accommodate all the chain and only used for storage of spare pipes and lines we hardly ever used. If relocating the chain could be achieved, there would be an additional advantage: 250’ feet of 3/8” inch chain weighs about 420 Lbs, therefore, the further aft the chain could be stowed, the lighter the weight on the bow would become, and it is always better to keep weight on a boats extremities to a minimum—at both ends—to reduce pitching inertia. There were two large compartments under the forward cabin bunks, the after-most one being the widest and deepest. This was 33” inches deep and 21” inches fore and aft, and spanned the width of the hull. It also had a solid glassfibre floor, which would be ideal, since the chain could spread better on the flat surface. The question was, how to direct the chain into the larger compartment? It is four feet further aft from the existing locker and I couldn't run a tube directly from the navel hole into the new locker, because it would pass straight through the middle of the double bed. When I installed a new Maxwell electric windlass to replace the old manually operated one, I positioned it on top of the bowsprit. The chain then ran smoothly from the bow roller, round the windlass wildcat, (also known as a gypsy), and down through the navel-hole - that’s the hole leading from the deck into the chain locker. 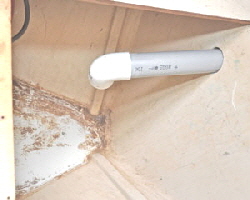 Its related tube, the hawse-pipe, is the pipe leading from the deck to the outside of the boat, but not many sailboats have hawse-pipes nowadays, because their anchors are normally stowed actually on a bow. The only route for the chain was down through the existing locker, round an almost 90� degree curve and along a tube under the bunks. But would it then continuously feed under its own weight? I decided to experiment using some 2” inch diameter plastic conduit pipe which is normally used to carry electrical wires. I bought this from our local Lowe’s Hardware Store for only $10.15, including a curved pipe. It is amazingly strong stuff, with a wall thickness in excess of 1/8” of an inch, (actually 0.162), and very rigid when connected together. The chain easily rolled off the wildcat and down into the original chain locker, because it was a near vertical drop. However, to get it into my new locker it then needed to pass through the curved pipe and travel a further 45” inches along a tube, to finally fall into the center of the new compartment. 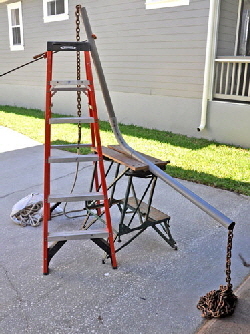 The long tube would therefore need to be angled downward enough to help overcome friction as the chain slid along it, then it would need to have a deep enough fall at the end for the weight to haul the rest of the chain in a continuous automatic feed. I had no idea what sort of slope would be needed, or how much fall the chain needed to continuously drag itself through this pipework. Nor could I experiment with the angle of the pipes in the actual fo’c’sle, because the 2” inch diameter tube had to pass through a bulkhead between the two compartments, and I didn’t know where to drill the large hole. There was only one way I could think of to determine a suitable angle. I assembled a crude mock-up, using my work-bench and a step-ladder to hold the tubes. 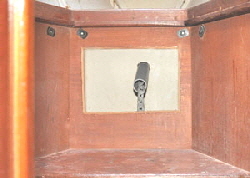 The down-pipe which would pass through the old locker was 34” inches long and the pipe to carry the chain into the center of the new compartment was 45” inches long. It all looked somewhat amateurish, but it gave me an idea of what sort of angle was needed. 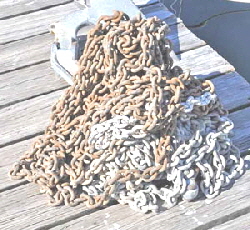 I used 50’ feet of chain out of the aft anchor locker, which was the same size of the bow chain. I fed it through the tubes, and after a bit of adjustment I found a minimum slope of approximately 10� degrees allowed the chain to run continuously, as I fed it into the top pipe. I took measurements and transferred it to where the hole needed to be cut in the bulkhead between the two compartments to carry the pipe. Before I could install anything I had to haul all the chain off the boat and pile it up on the marina dock, to give me a clear working space. 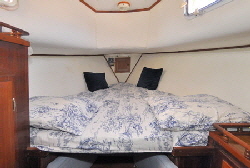 Luckily, the plywood base of the bunks had only been screwed to the beam structure underneath, so I removed the complete starboard side section, which gave me much more space to work in. I marked where the hole needed to be in the intervening bulkhead and cut a hole using a 2�” inch hole cutter. I also had to greatly enlarge the tiny drain hole in the bottom of the original chain locker, to be able to position the 2” inch diameter curved pipe. I didn’t want this to show above the 6” inch bed foam, so I kept it at 5” inches above the bed boards. 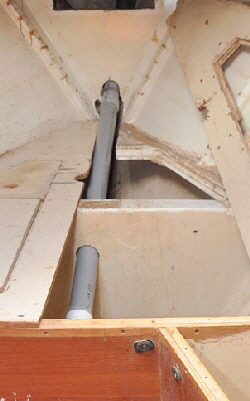 I found it impossible to use solid pipe to connect the navel hole on deck to the curved pipe below, because the angles were completely misaligned. I therefore bought a length of flexible truck fuel filler tubing from a NAPA store, which was just right, with a 2” inch internal diameter. I was able to join it directly to the 2” inch round flange on the navel-hole pipe using a hose clamp, then clamped the other end to the curved pipe at the bottom of the locker. This gave the chain a perfect lead into the curved pipe. When it was all finally assembled I had a continuous waterproof tube all the way from the navel-hole on deck, straight through the old locker, round the curve and along the pipe into my new chain locker. The total length was 86” inches. Having installed all the tubing I still couldn’t be absolutely certain if all this effort would actually eliminate the banking-up problem. I had used only a small length of chain in my simulation test, but as it pilled up in the locker the distance it had to fall would reduce. So the question was, would the fall still be enough to continue to self-feed right to the last link? There was only one way to find out. As I assembled the pipework I ran a 1/4” inch rope inside to enable me to pull the first links of chain through the tubes. I passed this line over the windlass wildcat and tied it to the first link, then easily pulled the chain through the complete tube and shackled it to a hefty eye-bolt which I bolted through the locker bulkhead. The maximum fall, from the end of the pipe to the bottom of the new locker was 27” inches, and the chain landed right in the center of the locker. The base of the new chain compartment was much bigger than in the bow, and also flat. I hoped this would allow the chain to disperse itself into a larger pyramid pile. Happily, this proved to be the case, because all the chain ran into the new locker on it’s own: every last link!! I fancied I even saw a little smile from the windlass, which would no longer have its teeth almost pulled out every time the chain j ammed. In the original layout, seawater coming in on the chain, (which can be quite substantial, especially with a full length rode), drained down the slope of the bow, then aft into the bilge. 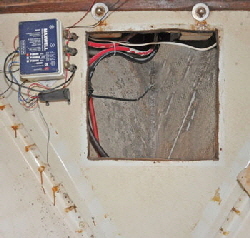 The boat manufacturers also put two drain holes in the bottom of the flat compartment floor, which drained into the bilge channel beneath. I was confident this re-directing had solved the vexing problem, but you never know on boats. Murphy is always just round the corner. If, just to be awkward, the chain ever jammed up again, the only way to knock the pile over would be to move the bulky bed foam, with all the sheets, covers and pillows, lift the locker door and reach down into the deep space. I could see this would actually be more of a nuisance than before. I therefore had a plan to be able to get to the chain pile easily and quickly. The rear of the new compartment formed the back of a seat between the vee births. 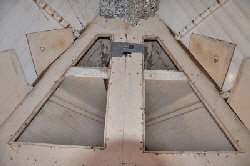 I therefore cut a large aperture in this panel, which offered immediate access to the chain compartment, without having to disturb the bunks. This also does not need a door, because the seat back cushion covers it up. It just needed trim round the edges. When I put the foam mattress’ back I did have to slice a taper out of the bottom of the foam, to eliminate a bump over the pipe, which is now completely undetectable when the bed is made up. Britannia now has a totally self-feeding anchor chain system, which has never failed so far, even on the rare occasions I have anchored using all the rode. I did receive a complaint however, from the first guests who used the fo’c’sle. They said it sounded like an earthquake as we weighed anchor one morning. But I didn’t pay much heed, because they should have been on deck as we got the ship underway. On the plus side, Britannia’s bow came up about an inch, due to shifting the heavy chain further aft. 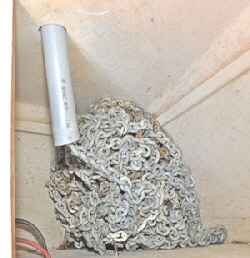 Does your boat have an inadequate chain locker which won’t accept all your chain without having to knock the pile over? If you can manage to fix it, it will come as a wonderful relief every time you weigh anchor, and all the chain mysteriously disappears down the navel-pipe.